Add Curly to the list of out-of-town clients I've never met in person. It's been so long I can't remember who pointed her in my direction. Our first project together was when I designed the birth announcement of Curly & Andre's daughter Capri in 2009. Since then we've done multiple projects, communicating with each other between Columbus and New Bremen. Shortly before Curly began wedding planning she moved to Arizona which pretty much ensured that we'd not meet in person anytime soon. Not that I was opposed to commuting to Arizona to show her my samples. I could have used the break and then skipped over to visit my friend Margie (hey girl!) . Turns out we didn't need to visit in person. Curly had a very clear vision and with the help of pinterest, and online proofs emailed back and forth, we got it done. Plus, Curly wins the award for "fastest replier of emails". This girl is driven to accomplish! Thanks Curly for your business! You and Andre looked amazing and I'm so happy for you. I had to laugh when only days after you returned from the honeymoon you were in party planning mode again - I'm looking forward to designing the birthday party invites for Miss Capri! That's right, there's an envelope there. Curly found a cute idea on pinterest. Clear envelopes. I checked them out and turns out they are USPD Approved. A clear poly envelope with sealing strip. Looks awesome and unique. Note: Curly did say that it took longer for some of them arrive in her guests' mailboxes. Shades of purple and shots of gold were the colors of the day. Playful dots embellish the elaborate font. That's Curly. Splashy, bold fonts. I used a stretchy gold cord to keep all her pieces together. Note the fun line on the bottom. 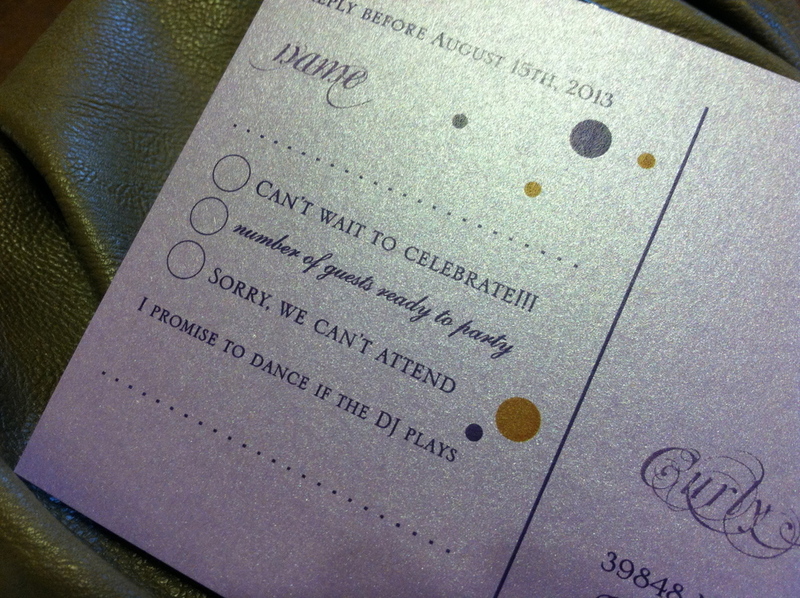 "I promise to dance if the DJ plays ______" Cool idea that helps set the pace of the party. And she partied with her beautiful bridesmaids! Curly was very into details. I happily emailed the monogram to her so that she could have this awesome backdrop made. 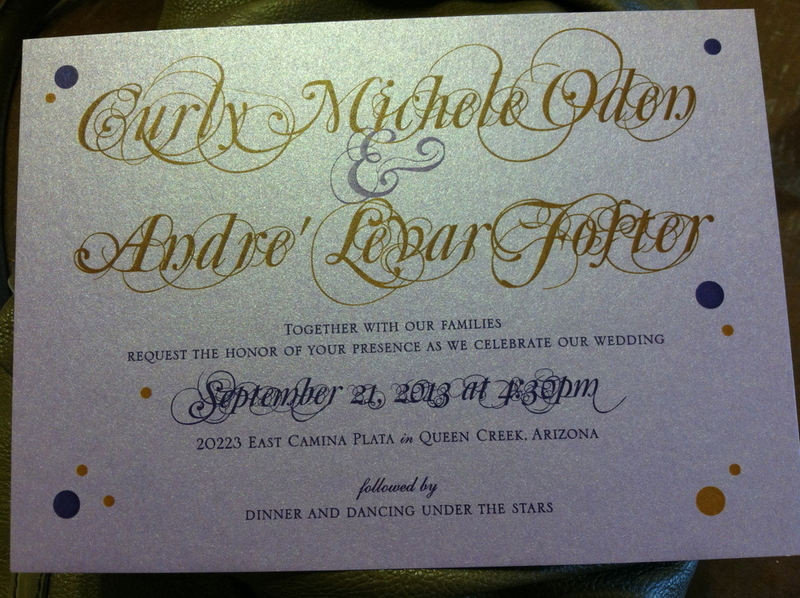 The designer did an awesome job of combining the elaborate monogram font and signature dots with the backdrop design. The good-looking groom enjoying the night. Looks like a fun crew!! Curly played on the Arizona locale with salsa and chip favors. We designed a little monogram card that fit over the top of the salsa. Take a clear poly-bag. Fill with essentials and add a fun bag topper. I have a feeling some of the guests needed the kits after their fabulous night.